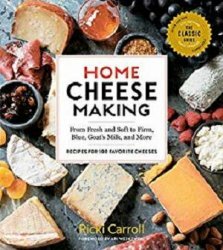 Widely acclaimed as "the Cheese Queen," Ricki Carroll has guided thousands of home cheese makers and inspired the burgeoning popularity of artisanal cheese making with her classic book, Home Cheese Making, first published in 1982, with over 400,000 copies in print. The completely updated fourth edition features 35 new cheese recipes, color photography of step-by-step techniques, and new profiles of contemporary cheese makers. The additions to this comprehensive volume reflect the broader selection of cheeses available in specialty food stores and groceries, including burrata, stracchino, Brillat-Savarin, D'Affinois, Cambrales, Drunk Gouda, Pecorino Pepato, goat milk's gouda, and more. Companion recipes are included for cheese plate condiments and classic cheese dishes. For cheese lovers wanting to make their own, Ricki Carroll's expert advice is the key to success.